There could be a happy ending here, but there's only one way I see that happening. The organic food movement isn't going anywhere. As consumers learn more and more about where their food comes from -- and the effect it has both on their bodies and on the land -- the stronger it becomes. Given that, you'd think a company squarely focused on natural and organic goods would be a good bet. Case in point: Hain Celestial (NASDAQ:HAIN) reported earnings last Tuesday and the stock promptly fell 6% (although it recovered later in the week). Read on to see why this actually shouldn't be too much of a head-scratcher. Believe it or not, I was once a Hain shareholder. However, I sold my shares in early 2016. My reasoning was pretty simple: The company's growth-via-acquisition strategy was risky and fraught with cultural landmines. Additionally, having a mish-mash of smaller local brands under the umbrella of a multinational company like Hain Celestial risked the company losing what really matters: an emotional connection with consumers. Indeed, as former hedge-fund manager Mike Alkin pointed out at a January conference, traditional consumer packaged goods (CPG) companies are in trouble. Millennials are becoming the dominant consumers, and they're looking for three things: goods that are organic, from a small company, and as local as possible. While there's obviously a wide range of behaviors among millennial consumers, I find his assertion convincing -- especially in the face of weakening brands across the CPG market. Hain checks the first box (organic), but its stature as a publicly-traded company makes it diametrically opposed to millennial preferences with respect to the other two. Since that January 2016 article, the company has also dealt with an accounting scandal and an activist investor coming on board. On the whole, it has underperformed the broader market by over 75 percentage points. HAIN Total Return Price, data by YCharts. That might lead you to believe the stock is a deal at today's prices. After all, Hain Celestial does have some popular names in its niche, like Garden of Eatin', Earth's Best, and Tilda rice. It has also undergone a restructuring plan -- dubbed Project Terra -- to drastically cut costs and focus on its most popular brands. But Hain stock doesn't look like a bargain to me. Cost-cutting is necessary to shore up the company's finances, but without a solid footing of the underlying business, it can only do so much. Revenue growth has slowed markedly, especially in Hain's most mature market (the United States). Total sales rose 2% on a constant-currency basis last quarter, while adjusted operating income declined 32%. Data source: Hain Celestial fourth-quarter earnings report. Chart by author. Revenue growth presented on constant currency basis. Operating income reported on an adjusted basis, as per management's presentation. Management made it clear that much of the shortfall came from the decision to cut many products out of the company's mix and pointed toward a 2019 forecast that calls for a midpoint of 3% sales growth (to $2.5 billion) and 12% earnings growth (to $1.30 per share). Millennials will end up wanting two things from their "better for you" food: the aforementioned small and local vendors, or the lowest possible price. We already know that Hain can't compete with the former, while going after the latter would drastically reduce margins. Already during the fiscal fourth quarter, gross margin contracted by 367 basis points to 20.19%. Private-label organic brands will -- pardon the pun -- eat Hain's profits over the next few years. And even if the company does reach its fiscal 2019 targets, there's the matter of price. Hain has produced $50 million in free cash flow over the past 12 months, and -- thanks to an enormous "CEO succession" package for outgoing founder Irwin Simon -- the midpoint of the company's free cash flow forecast for next year is $35 million. That means shares trade for 59 times trailing free cash flow and 85 times forward free cash flow. That's fine for companies that are growing like weeds. Hain simply isn't one of those companies. There's one factor that I've left out thus far: Hain's plan to sell its Pure Protein division sometime in the first half of 2019. The divestiture could bring in as much as $700 million, according to some outlets, but there's no guarantee that will happen. If it does, it could not only provide a bump to shares, but the cash could be used to buy back shares or pay a special dividend. 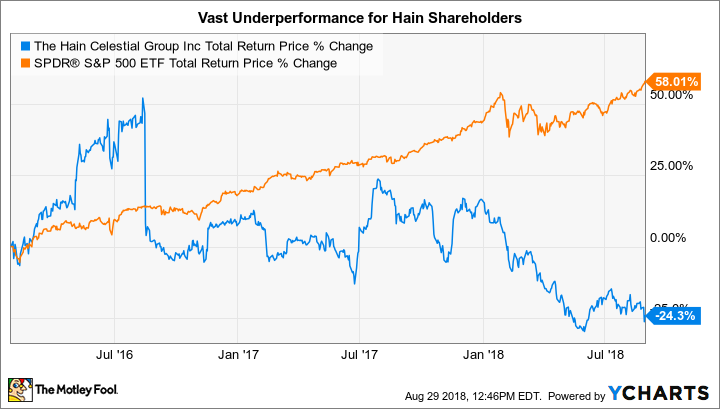 Additionally, with the jettisoning of Pure Protein, Hain may become an acquisition candidate for larger industry players that would pay a premium to take the company off of the public markets. But betting on acquisitions and divestitures is a risky game. The underlying fundamentals of Hain's business are poor -- especially with the price tag it now carries. If Hain Celestial can find a buyer despite these dynamics, that would be great for the company -- and shareholders. But I'm not holding my breath.